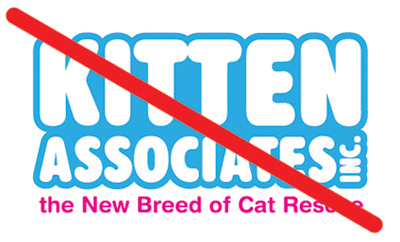 It is with great sadness and reluctance that I announce, effective today, that my non-profit rescue, Kitten Associates, will be closing its doors for good. With adoptions and donations at all time lows and volunteers difficult, if not impossible to find, I feel that my time would be better suited letting others do this good work of saving cats since I have been a complete failure at doing so. As the saying goes, when one door closes, another one opens. As I scooped the last pan of litter and re-homed the last cat, I had a vision of what I need to do next. Please join me in celebrating this new chapter in my life—the launch of our newest venture, Pebble Associates, Inc.! 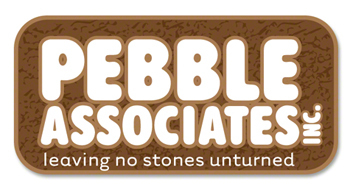 What IS Pebble Associates all about? Simply put, we rescue rocks from cruel living situations where they might otherwise be ground up and used as decoration in expensive landscaping or to provide a surface for a driveway, which, in turn, would abandon them to be repeatedly run over day after day. That's something we find intolerable! Rock rescue, before today, was simply unheard of and it's high time something was done about it. Consider this-how many rocks do you see each day as you travel to work? Or do you see them causally dumped in piles by cruel-handed gardeners in your neighbor's yard? How many of these rocks ever hope to get proper care and consideration, while eeking out an existence? We've developed a list of important tenents that guide me to my new purpose in life. 1. No rock should be subjected to EROSION-especially by water and wind. ALL ROCKS SHOULD BE INDOOR-ONLY. 2. Rocks should never be spade, shoveled or otherwise disturbed once they are placed in the home. 3. Rocks should have regular care, which includes keeping them clean, but not exposed to harsh abrasives, given no food of any kind, not even a treat, and always kept at a comfortable temperature to prevent fissures or cracks from occurring. ©2008 Robin A.F. Olson. 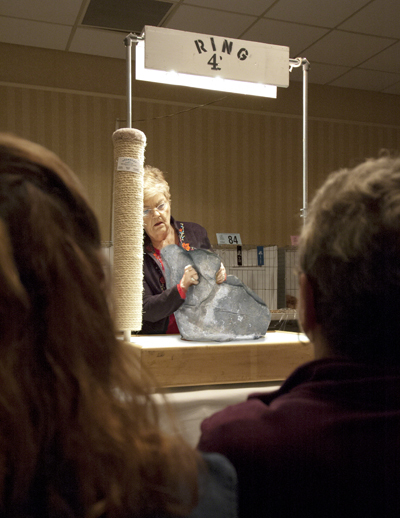 Granite being judged at a Gem & Mineral Show-how disgusting! That rock should not have been used for such greedy and malicious purposes. 4. We suggest that rocks be adopted in, at least, pairs, unless they are boulder-sized, particularly when it comes to pebbles as they do much better in groups or cozy piles. 5. Cruelty to rocks will NEVER be TOLERATED-and we're talking about using Rock Tumblers, Jackhammers, Chisels, or Diamond-tooth Saws on them! 6. Rocks should come from Rock Groups or Rock Shelters, NOT from a fancy-pants Gem & Mineral Show. There's already too many rocks on the planet and we need to act now to keep the problem from turning into an avalanche. I hope you'll support my new dream with your donation to Pebbles Associates. It's good-hearted folks like you that help me, help them. Check out PetRockFinder.com to find your perfect pebble. Don't forget to CLICK this image to see the lovely design at a larger size! Your donation will also go to our new programs; Pebbles & Parolees, where we re-home rocks into the homes of ex-cons after they're released from prison, and My Cataclasite from Hell, that helps repairs faults in cataclastic rock. One day we hope to expand this program to Mesocataclasite and Foliated Cataclasite rocks, too! As with any new undertaking, there's a great deal of work to be done and many rocks to rescue, from our fossilized-“seniors” to our newborns-rocks born from free-roaming molten lava. I know we can't save them all, but it will be worth it to the ones we save. It's taken hundreds of millions of years to get here and it will probably take the same amount of time to get the job done, so we better act NOW! @2013 Robin A.F. Olson. 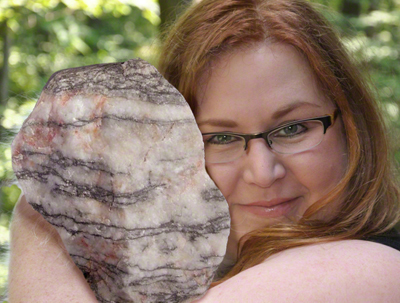 Me with Tiger (left) who is our first (Gneiss, Metamorphic-coated) rock available for adoption! If you're as excited as I am and want to add a rock, boulder, or basket of pebbles to bring joy to your home, you can find your next cold, hard, friend via our new portal on Petrockfinder.com or check out our Adoption Flyer, below! Don't forget to CLICK this image to see it at a larger size that you can print out and enjoy! Thank you to everyone for all their support over the years. I hope you share my new passion and become part of this next phase of my life! Robin--You are so funny. I knew this was an April Fools joke as soon as I read that you were a complete failure at resueing cats. You should have chosen a line that people would have a chance of believing. Anyone that has followed you at all would have to realize that this was a joke. I sure hope this is an April Fool's hoax!! Happy April 1st to you too! Happy April Fool's Day, Robin! I'm writing this while cooking a slow braise of Possum, Wendy, Harris and Toffee in my new, orange 14-quart Le Creuset (shoplifted with EXTREME difficulty from Williams-Sonoma since it weighs 38 pounds and didn't completely fit under my tent dress). I'm stewing them with potatoes, celery carrots, and lots of fresh cilantro and garlic, by the way.... do you think they need mushrooms? I thought that, for braising, you're supposed to keep the burner at a very low temperature? I guess I got it wrong because, despite that heavy lid, all four cats got bored and jumped out about 10 minutes ago. They are busy licking broth off each other and chasing a couple of potato chunks around the apartment. Better luck next time. But I still want Tiger! Toffee in the stew?? You didnt save that for dessert?? Hmmmm, you muxt like your stew a little sweeter than I do. Robin, that's a good one. You got my attention. Happy April Fool's Day. Haha! You had us going at first! Good one!! Robin, do I need to fill out another application to adopt Tiger? I hope not! But can you please send me some photos of Tiger from the back and the sides? I like my rocks to have just the right amount of pink in them and I need to be sure Tiger is exactly what I'm looking for. I got a lot of applications in on Tiger, already, so not sure if it will work out. We have some other rocks that are a bit older, say about 10 million years or so? Or did you want something closer to lava-aged? No, no, it has to be Tiger! No, no, it has to be Tiger! There's no other rock that can compare and I've been looking all over New England. I could tell as soon as I saw Tiger's photo. With rocks, you just know, it was love at first sight. So let's get this adoption rolling, please. You're free to check with my geologist, who will give me a good reference, I'm sure. And would you like to do a home visit? We're have quite a nice stew for dinner tonight and if you and Sam left in an hour or two, you'd be in time. Or does Connecticut law prohibit you from driving rocks across state lines? I'd have to get a Health Cert for travel out of state, you know that already! I doubt I could get an appointment with a geologist in time. Maybe I can forge the paperwork and no one would know? I realize you have your heart set on Tiger, but I can't help that it's the rock everyone wants to roll with! Being that it's "rock season" we should be able to find you something like Tiger, maybe not with the same personality..wait..what am I saying? Of course the same personality!..but maybe it won't be quite as friendly. Are you okay working with it for awhile? It's might be nice, but a bit skittish, across ponds and other bodies of water. My Cataclasite from Hell" ??? LOL! Off your "Rock"er ... good one!!!! LOL!!! I can't believe anyone thought this was real!! this is awesome - I love this, more please - and when is your open day for pet rock inspection and adoption outreach? You had me completely fooled. I was like WTF? From cats to rocks? I thought you lost your mind. It was hilarious, thanks for the laugh. Please don't leave the cats, we love you! But funniest April fool thing I've ever heard. Ingenious! Rock on Robin!